Splatoon 2 is the biggest current release for the Nintendo Switch. The Switch itself is an excellent gaming device worthy of a review in its own right as it perfectly fills the void between home consoles and portable devices. The major con for the Switch is the cost of the device itself. However, for an excellent review of the Switch’s capabilities (and a reason for owning one) head on over to Trusted Reviews’ Review or WIRED’s special article on how the Switch is the future of gadget design. This as said is a review of Splatoon 2 and not the Switch, and provides another reason for why splashing out on a Switch is worthwhile. What makes Splatoon 2 Inkresistable? Splatoon 2 builds on the unique mechanics of the original game (which was one of the best releases on the Wii U). These are ‘shooter-mechanics’ in which covering a surface in a steady stream of multicoloured ink is the key idea. This game chooses to use characters who are a species of half-human, half-squid Inklings, who can transform into squid form and swim through this ink. This allows for moments when a gamer can cover a wall with ink, morph into a squid and swim up the wall. Gamers can also use this transformation mechanic to hide in the ink and pump unsuspecting enemies full of ink. In true Nintendo fashion, this twist on the shooter genre focuses on friendly colourful characters and rich cartoon animation styles. This is a game that is beautiful on the eyes and senses in many ways. In many ways, however the game focuses on multiplayer – despite this the single player mode is of terrific value and worth playing. In the same way that For Honor’s and Injustice 2‘s single player modes were a tutorial for the multiplayer mode, Splatoon 2’s single-player mode is a tutorial for the multiplayer modes. In this single-player mode you can tackle a story in which you must retrieve the Great Zapfish (reminiscent of classic Nintendo storylines Zelda and Mario in particular) by clearing various platforming stages. To reach these stages players need to use their ink-shooting skills to access platforms and uncover various grills on each world. Once the main platforms on this world have been cleared and a smaller zapfish has been rescued from the Octarians (villains of the Inkling people), a boss level unlocks which tests all the skills and abilities practiced across the previous levels. This is a game which those who are ‘completionist’ or collectors will love. Each story level has several collectibles associated with it which can be spent to upgrade weapons and gear. There are also the ability for players to buy gear for use in the multiplayer formats (with in-game currency). 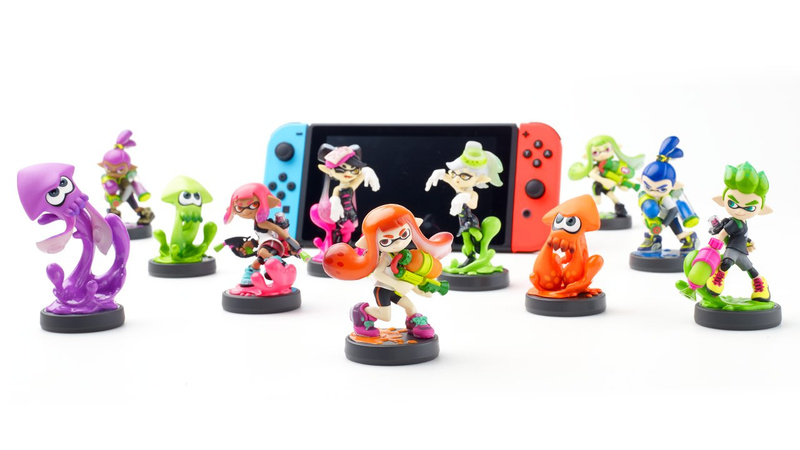 Just as importantly for collectors, Splatoon 2 has released alongside a range of new amiibo figures (and a re-release of all previous figures). The figures mainly unlock special gear in-game, however aside from this they are beautifully sculpted and molded – providing some of the most artistic amiibo designs to date. Watch the following video for some details on how the new Co-Op mode Salmon Run, operates. However, one of the biggest complaints about this fun and addictive mode is that it is only available at particular times (and of course you need to have a Co-Op friend to play with who has their own version of the software). In many ways this is one Splatoon 2’s bigger issues – that the online connection is not currently the most consistent in regards to the NAT. However, a brief search confirms that a few minor adjustments to an internet router may help in this department and change the NAT rating appropriately. As mentioned above, the biggest issue with Splatoon 2 is that to play any style of couch co-op multiplayer requires another Nintendo Switch console and game cartridge. This is not dissimilar to other multiplayer games such as Overwatch. However, where it becomes near impossible to easily transport a clunky system the Switch lends itself to portability. Meaning it is well worth visiting friends who have a device and playing with them. In summary, Splatoon 2 is one of the must-have games for the Nintendo Switch. When the Switch first launched it appeared as if The Legend of Zelda: Breath of the Wild was console seller. This has since changed with the release of Mario Kart 8 Deluxe, Arms and now Splatoon 2. When I play these games, they will likewise be reviewed in turn. However, Splatoon 2 is easily enough of a reason to buy the Switch and enjoy the reason why Nintendo games are so fantastic. With that unique, zany, colourful fun that blasts a trail of ink right to the core of gaming joy. And with the Switch, Splatoon 2 is so easy to pick up and put down in mere moments. Making it addictive fun for all ages. That’s all for this game review. Stay tuned for news on The Legend of Zelda: Breath of the Wild (once this reviewer completes it); Middle Earth: Shadow of War; Super Mario Oddyssey; and any other future games played. Across the Switch, board games and Xbox One.